WASHINGTON - More than three decades after he first appeared before the panel as a 27-year-old Vietnam veteran-turned-antiwar protester, Senator John F. Kerry will be named chairman of the Senate Foreign Relations Committee, giving him enormous influence over President-elect Barack Obama's foreign policy, according to congressional officials. Kerry, 64, is still considered by some political observers to be a possible pick for Obama's secretary of state, but Senator Hillary Clinton of New York and former New Mexico governor Bill Richardson, each of whom met separately with Obama at his Chicago transition office last week, are considered far more likely selections for the position of top diplomat. Still, from his new perch on the Foreign Relations Committee, Kerry would play an "enormous gatekeeping role," said Ralph G. Carter, a professor at Texas Christian University and coauthor of the upcoming book, "Choosing to Lead: Understanding Congressional Foreign Policy Entrepreneurs." "The role of Senate Foreign Relations Committee chair is enormously influential," Carter said. "It gives the person who holds it an incredible position to shape policy." Along with the Judiciary and Finance committees, the Foreign Relations Committee was among the first three Senate panels established, in 1816. It is responsible for vetting international treaties before ratification by the full Senate, and for conducting the confirmation hearings for presidential nominees for the State Department, including all foreign ambassadors. The committee also oversees the State Department budget and funds foreign aid programs, helps set arms control policy, and authorizes military training for allied nations. Kerry's elevation to chairman, to be announced as early as this week by Senate majority leader Harry Reid, is the culmination of a unique journey. It began when a shaggy-haired Kerry, wearing his military ribbons, testified for nearly two hours before the panel on April 22, 1971, the first Vietnam veteran to do so. Speaking on behalf of fellow veterans, he appealed for an end to US military involvement in Southeast Asia, posing the famous question, "How do you ask a man to be the last man to die for a mistake?" In what proved to be a highly prescient remark, committee member Claiborne Pell of Rhode Island - a future chairman himself - expressed hope that the young Kerry would one day "be a colleague of ours in this body." Now Kerry is set to take over the committee with an impressive set of credentials. He is the third-ranking Democrat on the committee, behind Chris Dodd of Connecticut, who will remain chairman of the Banking Committee. Kerry has served on the committee for 23 years - including stints as chairman of the Asia and Middle East subcommittees - and has overseen legislation on a wide range of issues, such as human rights and Russia's invasion of Georgia last summer. He also negotiated the creation of a war crimes tribunal to try the perpetrators of genocide in Cambodia, was instrumental in normalizing US relations with Vietnam in 1994, and attended global climate change negotiations in Indonesia last year. He has been a leading voice in recent years on several of the foremost foreign policy questions. Kerry, who voted in 2002 to authorize the Iraq war that Obama opposed, introduced the first Senate amendment in 2006 to withdraw US combat forces from Iraq. While backed by only 13 senators at the time, his position was later adopted by nearly all his Democratic colleagues, and by some Republicans. In 2006, he was also among the first in Congress to call for more US troops in Afghanistan, a position that later became a key element of Obama's national security platform. Over the years, Kerry, whose father was a career foreign service officer, has traveled widely to meet with political and military leaders. Earlier this year, he made official trips to Egypt, Saudi Arabia, Israel, the Palestinian territories, Pakistan, Afghanistan, India, and Turkey. To some critics, including Andrew Bacevich, a Vietnam veteran who is a professor of international relations at Boston University, Kerry's career in the Senate has been a disappointment. 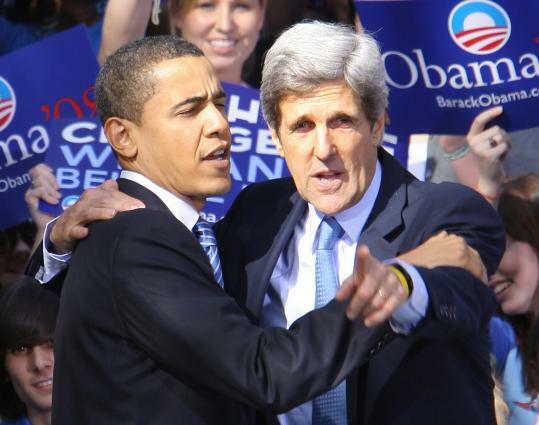 Kerry has not shown enough leadership, they say, and was wrong about the Iraq war. "Kerry's senatorial career is one of great potential unfulfilled," Bacevich said. As chairman of the committee, "he'll have a chance to redeem himself." But committee chairpersons from the same party as the president - as Kerry will be in the Obama administration - tend to play a supporting role for the White House, according to Carter, the Texas professor. Chairmen from the opposing party, such as Republican Jesse Helms in the 1990s and Biden in recent years, have taken a more confrontational approach. "He is going to be a facilitator for the president," Carter said of Kerry. "That is his style." But Bacevich believes Kerry must do far more than that - "not by competing with the White House and the State Department for control of foreign policy, but by undertaking a deliberate, comprehensive, and nonpartisan investigation of US policy since the end of the Cold War and especially since 9/11." Bacevich, whose son, Army First Lieutenant Andrew Bacevich, was killed at age 27 by a roadside bomb in Iraq in May 2007, added: "Things have gone badly wrong. There is an urgent need to find out why so that the next administration can effect the necessary course correction." Kerry declined to be interviewed because the announcement is not yet official. But his aides, speaking on the condition that they not be identified, said he already has a priority list as chairman. In addition to running confirmation hearings on Obama's selection for secretary of state and other State Department appointments, Kerry plans to seek quick passage of two bills that failed last year, the aides said. One would be to authorize additional aid to Pakistan to improve the country's relationship with the United States, considered critical in the fight against Al Qaeda. The second would be to provide more resources for Afghanistan's civil institutions. Other issues on Kerry's agenda are advancing nuclear nonproliferation goals, which Kerry believes enjoy more solid support than ever in both parties. Kerry also plans to use the committee to lay out a blueprint for the new administration on how to deal with global climate change, while addressing the Middle East peace process, Iran, Russia, and other pressing challenges, the aides said. But that won't be enough to make Kerry a truly effective chairman, Carter said. "There is a history of using the committee's hearings as a platform for investigating new ideas," Carter said. "The moment [for that] is right for two reasons. We still haven't fully adjusted to a post-Cold War, much less a post-9/11 world. That world is different, and a lot of our government and its bureaucracy and its apparatus are still basically a Cold War model." Secondly, Carter said, there is a need to "have hearings where we explicitly investigate why is it our actions provoked many resentments from both our friends and our foes, and what is it we could do to minimize it."